Magical gems and jewels can be cut and polished into an amazing array of shapes. Certain styles work better for certain mystical applications. For instance, an amber sphere can reduce fever when held in the hand. In general, cabochons or other rounded shapes have more feminine energy while faceted stones or long thin ones are more masculine. Within the faceted cuts, though, square and rectangular (such as “baguette” or “emerald”) styles are the most masculine while oval or almondine (such as “marquis”) styles lean towards the feminine. Round stones (such as “brilliant”) represent attraction, permanence, and perfection. Egg-shaped gems enhance fertility and creativity. Triangles imply balance or dynamic exchange; they can also convey protection. Rectangles and squares suggest stability, abundance, and grounding. Pyramid-shaped stones focus energy through the tip, like a metaphysical laser. Hearts are ideal for emotional influence. For elemental correspondences consider square for Earth, almondine for Air, triangular for Fire, teardrop for Water, and round for Spirit. Finally, these meanings can refer to inclusions or patterns within the stone as well as its outer shape, when dealing with those like agate or malachite whose markings sometimes form distinct images. Sometimes, when people study stone magic they stick to the more affordable rocks and semi-precious gems, based on the premise that a stone does not necessarily have to be large or flawless or expensive in order to serve a useful purpose. Other times they focus on exotic New Age stones rather than familiar gems. This tends to downplay the role of jewelry in stone magic, but remember that almost any piece of jewelry can work in that capacity. Big beautiful jewels can make a fine investment, both in terms of magic and in a durable addition to your wardrobe. Obelisks, pyramids, and generator crystals stand upright, ranging from less than an inch to over a foot in height. These typically produce, store, and/or direct magical energy. You can find quartz cubes, pyramids, dodecahedrons, and more. There are also faceted lead-crystal prisms in many forms – although manmade, they are still silicate mineral structures, and can be programmed similar to quartz crystals. (People who work better with natural energy tend to prefer earth-grown crystals. People who work better with technology tend to prefer carved shapes or synthetic materials such as lead-crystal prisms.) Pyramids make good projectors, cubes ground and stabilize, spheres contain energy, rectangular solids relate to masculine energy, eggs relate to feminine matters or fertility, and multifaceted shapes (dodecahedrons, icosahedrons, etc.) aid personality integration. Spheres and eggs also make wonderful pressure tools for massage. Finally, prisms hung in windows cast rainbows, which many people find uplifting; these are an important means of dispersing negative energy in the Feng Shui system of magic. In gems, jewels, and crystals – as opposed to generic rocks sometimes used in magic – the size and quality of the stone affect its effectiveness. While a small, flawed stone will still work, in most cases a better stone does a better job. Larger stones tend to possess a deeper well of power which gives them greater strength, range, or stamina. Flawless stones usually yield a sharper focus and more stability. Different people have different tastes and needs also. One stone worker might select a deep purple amethyst with lots of veils inside for sleep, while another would choose a pale clear one for banishing headaches, and a third would insist on the biggest AAA stone for an enchanted ring. Bear in mind that a "flaw" may be useful, though -- if an inclusion resembles an animal or symbol it can often manifest that power. Some crystals, like quartz, come in huge clusters. These work best as altar stones, house or land guardians; they pack a lot of power. Be careful with heavy magical stones – just because rose quartz is a “warm, fuzzy” stone doesn’t mean it won’t hurt if you drop a big chunk on your foot! The type of setting can help direct a jewel’s energy, too. Earrings affect the ears or head. Barrettes affect the hair and neck. Collars, torcs, pectorals, and necklaces all affect the neck or chest depending on their length; pendants may have the same effect, but if hung low enough can affect the torso or whole body instead. Necklaces long enough to wear without a clasp share the ring’s circular symbolism; clasped necklaces embody the “open yet unbroken” energy instead. Tie tacks or pins typically affect the heart and chest. Bracelets affect the hand or arm. Ankle bracelets affect the foot or leg. The quintessential “magic artifact,” rings affect the fingers or hand. Being a complete circle, a ring represents unity, eternity, reincarnation, and the universe. A turquoise ring guards against disease. You might find rings with a secret compartment under the stone, a place to hide such magical tidbits as a pinch of salt, a scrap of paper with a goal written on it, or snippet of hair from a loved one. (Traditionally called “poison rings” for their dark historical and literary uses, these are sometimes given more positive names, like “secret rings,” “trinket rings,” or “treasure rings.”) With a wave of the hand, an experienced Pagan can even direct the jewel’s power towards an outside target. Regardless of location, however, most jewels can extend their influence to the whole body if that is the wearer’s intent. Jewelers today offer more exotic options than those available in the past. Modern tools can carve gemstones into amazing shapes, including human faces and animals as well as the traditional geometrics. Settings may also depict people, animals, intricate knotwork, and so forth. These can greatly enhance a gem’s innate properties. For example, someone might seek a guardian angel pendant (set with a suitable gem like carnelian or tiger’s eye) for protection. Popular animals include ant (industriousness), bear (healing), cat (magical ability), dolphin (intuition or swimming skill), dragon (ferocity), eagle (vision), horse (speed), lion (strength or courage), monkey (cleverness), owl (wisdom), rabbit (fertility), snake (regeneration), unicorn (purity), and wolf (loyalty or musical talent). Carved fetishes (fish, frogs, or rabbits for women; dogs, lions, or dragons for men; also male or female figures) of amber enhance fertility. Fetish carvings, symbols, and gemstone animals usually run quite small – less than two inches – but in the softer, more common stones like onyx you can sometimes find larger ones. These most often serve as mnemonic reminders, archetypal or symbolic icons of enchantment, and references to a person’s power animal. Symbols of long life, such as the ankh, and animals widely associated with magic, such as the cat, are most popular here. Fetish carvings offer a way to invoke other animal powers, though, like wisdom (owl) or regeneration (lizard). Shaped stones may serve decorative or functional purposes, like mnemonic cues or pressure tools. Crystal wands usually have one round and one pointed end, with a faceted or round body. These may be used like metaphysical “erasers” to remove stains or blockages in the aura, or aligned with the spine to balance the chakras. These measure anywhere from 2-7 inches long, on average. Long crystals can also be used as wands in ritual, for directing energy. Sometimes you see a blend of techniques used to create a whole new item. Artisans may take a basic tumbled stone and carve or paint it, for instance. Totem Stones feature animal images such as wolf or hummingbird. Inspirational Stones display words like “Dream” or “Wonder.” Rune Stones show runes such as Uruz/Aurochs, Thurisaz/Thorn, Kenaz/Torch, or Berkano/Birch. Agate slices make a beautiful windchime. Geodes may house a metal figurine or symbol. Stones also find their way into other artifacts as components. Desktop fountains often incorporate magical stones, and you can easily add stones to most fountains even if they don't come in the original package. The pendulum is a classic tool of divination, usually made from a crystal hanging on a chain. They can be specialized for healing, divination, or other purposes. Lamps, candleholders, nightlights, and other such devices may use stones as bases or shades. 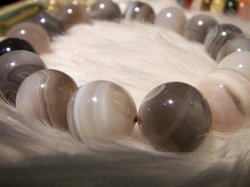 The light then takes on some of the stone’s mystical energy, conveying it to nearby people in a subtle and peaceful way. Some candles have semi-precious stone powder or pieces embedded in the wax. Each type of item has its own energy signature; experiment to see which ones you like.